Linear guide bearings are used in applications where a component needs to be moved along a straight line with high accuracy. The object may also need to be returned to its origin with high repeatability. 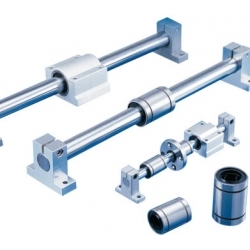 Linear bearings come in a variety of styles and have wide load capacities. Choices for linear bearing styles include air, flat ball cage, ball spline, ball bushing, needle roller cage, cam follower, crossed roller, guide wheel, hydrostatic, plain or journal, linear motion guide, flat roller cage, and linear roller. An air bearing is a very low friction bearing that rides on a cushion of air. A flat ball cage is a non-recirculating or recirculating bearing design where the balls are trapped in a frame that spaces them at equal distance. A ball spline bearing has balls that contact grooves in a matching spline shaft on at least four sides, depending on the number of splines. A ball bushing is similar to a bushing in construction but has rows of balls to reduce friction and increase stiffness, accuracy, and smoothness. Caged needle bearings are low friction, high load bearings in a composite cage.A cam follower is a wheel on an axle and that wheel runs on bearings. Roller and cross roller bearings are used on linear ways where straightness and accuracy are critical. A guide wheel is a low cost, versatile and rugged alternative to traditional linear bearings. A linear hydrostatic bearing works much like an air bearing. The bearing body rides on a thin film of oil or water that provides for near frictionless movement. Journal bearings consist of a split cylindrical shell of hard, strong metal held in a rigid support and an inner cylindrical part of soft metal, which holds a rotating shaft. 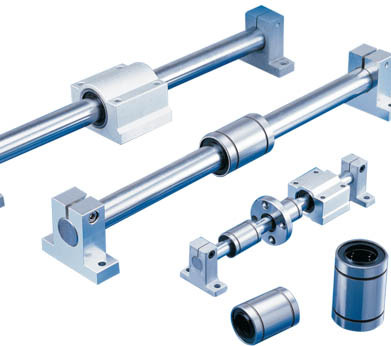 A linear motion guide is a linear profiled rail that has a set of mating bearings that travel along the rail. A flat roller cage is similar to crossed roller bearings except that the axes to all of the rollers are parallel instead of crossed. A linear roller is a set of circulating roller bearings that ride on a round or flat guide. A bearing or rail assembly is a complete assembly comprised of the bearing and guide or rail.